This album is now available for download for the first time. 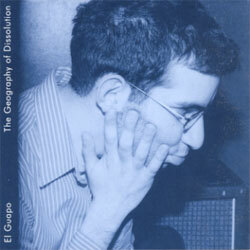 "The Geography of Dissolution" is the only document of the eight months El Guapo spent as a four-piece in 1999. Two live sets — one recorded by Davis White at the Black Cat in D.C., another recorded in New York at Tonic by Damon Caldwell — chart the group's transition from art-punk to the avant-garde. Damon died shortly before the record's release, and "Geography of Dissolution" is dedicated to his memory.